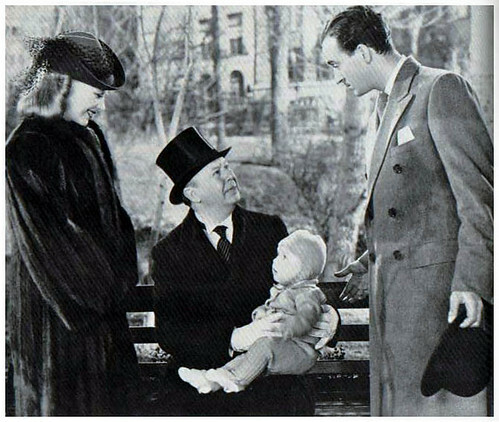 Ginger Rogers raises an abandoned baby in Bachelor Mother. Here she is with Charles Coburn, Elbert Coplen Jr., and David Niven. The Stars: Ginger Rogers, David Niven, Charles Coburn, and Frank Albertson. Source Material: An original story by Frank Jackson. A British postcard adveritising Bachelor Mother. Awards: Nominated for one Academy Award: Best original story for Jackson. The Plot: Department store worker Polly Parrish (Rogers) finds an abandoned baby (Coplen) on a doorstep. A series of misunderstandings lead everyone to believe that Parrish is the child's mother, including her boss (David Niven), who threatens to fire her if she abandons the boy. 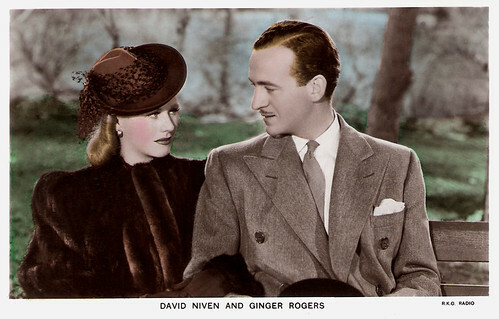 David Niven questions Ginger Rogers about her parenting skills in Bachelor Mother. Backstory: Jackson's original screenplay had been kicking around Hollywood for several years before RKO Pictures picked it up in 1939. Universal Studios used the script in to make a Hungarian version of the story called Kleine Mutti (Little Mother) in 1935. Finally, RKO decided to use Jackson's script for Ginger Rogers first starring role without Fred Astaire. 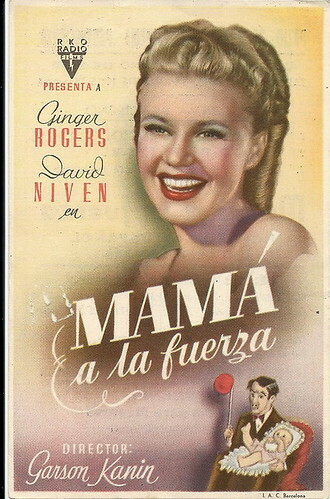 Rogers was understandably reluctant to take on the part: Unwed motherhood was an extremely risque topic in 1939, but producer Pandro S. Berman persuaded Rogers to make the film. Rogers didn't regret it. Bachelor Mother was one of RKO's biggest hits of 1939, and it made Rogers a working class heroine. The next year she won a Best Actress Oscar for playing a somewhat similar role in Kitty Foyle. A vintage poster for Bachelor Mother. Best Performance: David Niven as David Merlin. I nearly gave this to Charles Coburn because he is so touching in a scene where he thinks he's meeting his grandson for the first time, but this film really belongs to Niven. Rogers is great, but Niven, playing his first romantic lead, effortlessly steals every scene he's in, managing to be both hilarious and debonair at the same time (see the clip below). Best scene: David and Polly discuss the best method for feeding the baby. Best Line: "I don't care who the father is, I'm the grandfather!" J.B. Merlin (Coburn). Niven: 1939 was a breakthrough year for Niven: He gained critical praise for his roles in Wuthering Heights and he cemented his debonair screen image by playing a suave jewel thief in Raffles. 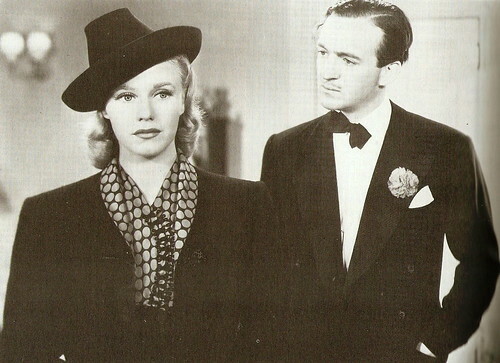 Bachelor Mother was Niven's biggest hit of 1939 and his first romantic leading man role, but he left Hollywood shortly after making the film. The Scottish actor returned to the United Kingdom and joined the Royal Air Force to help defend his country against the German air raids that were devastating Great Britain. 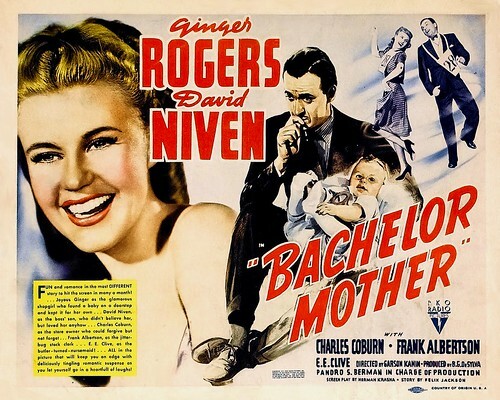 Niven, part 2: Bachelor Mother was a huge hit in the UK, and Niven was often recognized during his days in the RAF. However, Niven's new found stardom didn't impress everyone. When he informed a member of the ultra-exclusive men's club, Boodle's, that he had been making "pictures" in America, the gentleman eyed him suspiciously and remarked, "Oh, really. Watercolors or oils?" Fun Fact: Polly and David celebrate New Year's Eve outside a movie theater advertising RKO's other 1939 blockbuster, Love Affair. Here's our essentials entry on that film. 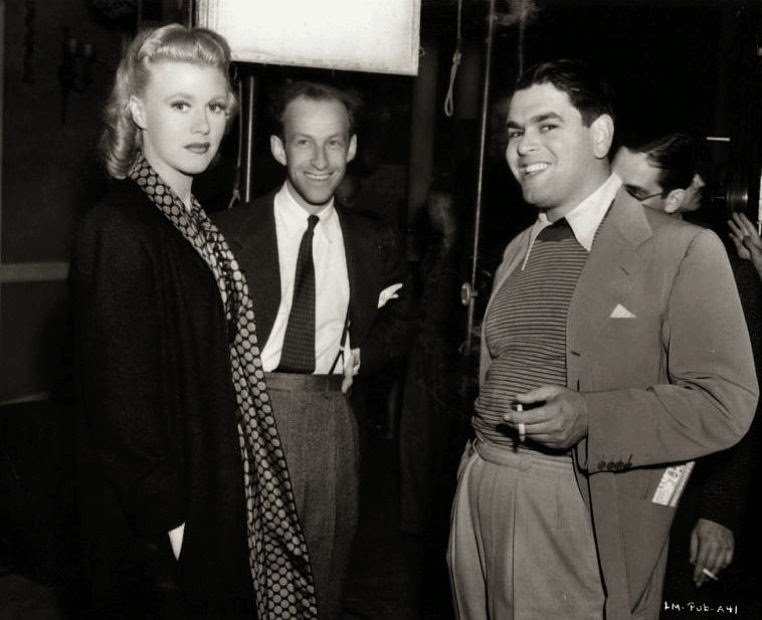 Ginger Rogers, director Gason Kanin (center), and producer Pandro S. Berman on the set of Bachelor Mother. Why it's essential: Quite simply, Bachelor Mother is a joy to watch. Rogers and Niven have great chemistry -- they probably would have become a romantic team if World War II hadn't interrupted Niven's career. Kanin's direction is sharp and witty with many memorable set pieces like a crowded New Year's Eve celebration and a wacky dance contest. Bachelor Mother is also notable because it deals with real life in the 1930s. Most screwball comedies featured wacky heiresses, but Bachelor Mother is grounded in reality. Polly is a working class woman who needs a job to pay the bills, making her very much like the secretaries and factory workers who bought movie tickets in 1939. Availability: Bachelor Mother is streaming on Warner Archive Instant. It is also available on DVD and video on demand. Next week, Rogers and Astaire play a legendary ballroom dancing team in The Story of Vernon and Irene Castle.